...that Jacob Keyes' pipe can be found sticking out of his Flood body? This article is about the installation. For the weapon-mounted telescopic sight, see A2 Scope. The A2 Hydroelectric Facility is a hydroelectric dam in Tanzania in the East African Protectorate. Located along an unidentified river, it is a part of the Global Water Campaign installations in the jungle south of Mount Kilimanjaro supplying water to the GWC Trans-African Pipelines. 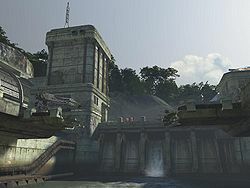 By the 26th century, while the main facility of the GWC had fallen into disrepair, it seems that the dam was at least partially active by 2552 as evidenced by newer equipment present in the facility. During the Battle of Earth on November 17, 2552, after John-117 was recovered from the jungle, Sergeant Major Avery Johnson was captured by Covenant forces and freed by John-117 and Thel 'Vadam. The three of them and all surviving Marines were then extracted by Kilo 023. Concept art of the facility.